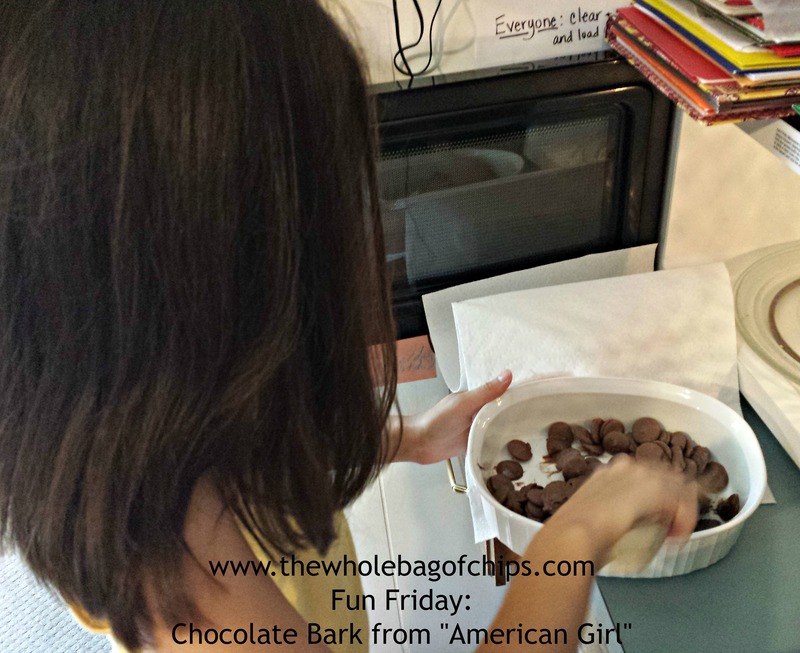 A very kid-friendly recipe from “American Girl” magazine provided our whole family with a yummy treat all week! I love that my kids love to read, they love to get magazines in the mail and they love to cook and bake. Each of them receives two magazines in the mail geared to their age level, and as soon as they’re out of the mailbox, the kids are looking for any great new recipes that I might say “yes” to. It’s not that I say “no” about trying out a new recipe very often, it’s more of “Not now, we don’t have time to do that today,” or “I don’t have all the ingredients for that right now, but remind me later.” The girls have even learned to preface their immediate “Can we make this today?!?! ?” with more of, “Do we have any plans later today?” or even, “Do we have flour, sugar, butter, and apples?” for example. Earlier this week one of my daughters received her latest edition of “American Girl” magazine, which she absolutely loves, but which only comes every other month. Clearly not often enough. There were several versions of bark to choose from, and she found one for which we had all of the ingredients. ingredients, and lo and behold….she found a great one! 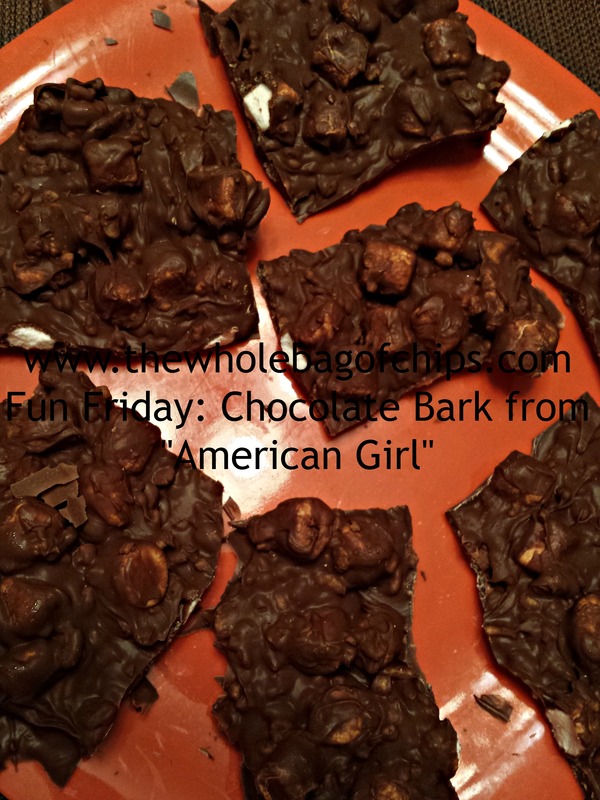 It was a quick, easy and kid-friendly recipe spread containing several Halloween-themed chocolate bark recipes. We had all the ingredients for one in particular, and she made it for our family the very next day. We had limited time on this particular day, just a couple of hours in the afternoon to clean up from lunch and prep for dinner. I personally had no time to be making a dessert, so I was thrilled when we realized that she could do this recipe 100% on her own. She used a 12 oz. bag of milk chocolate melts that we had on hand. The recipe called for two cups of dark chocolate melts and our bag worked out fine. She needed 1/2 cup of crispy rice cereal and 1/2 cup of marshmallows. We used the same measuring cup for both items, less to clean later on! The recipe gave instructions for covering a baking sheet with wax paper and melting the chocolate melts in the microwave. She melted 30 seconds at a time, stirring in between each time. Once melted, the mix-ins of rice and marshmallows were stirred into the chocolate and the chocolate was spread evenly onto the wax paper and carried down to the freezer. I love to see how proud my kids are whenever they make something for the whole family to enjoy. As we left for the rest of the afternoon, I knew that my daughter couldn’t wait to get home so that she could check the freezer and see if her bark was done. Sure enough, after being gone only a few hours, we came home and she went straight down to the freezer, carrying up the tray of hardened bark. It was ready to eat! She was so excited! After dinner, she grabbed a tray, broke the bark into semi-even pieces and served the family her dessert. She was so proud as everyone complimented her tasty dessert and her hard work. As we talked later on about how great the recipe was, we came up with some other mix-in ideas, including graham crackers instead of the crisp rice cereal, which would make more of a S’Mores type of dessert. 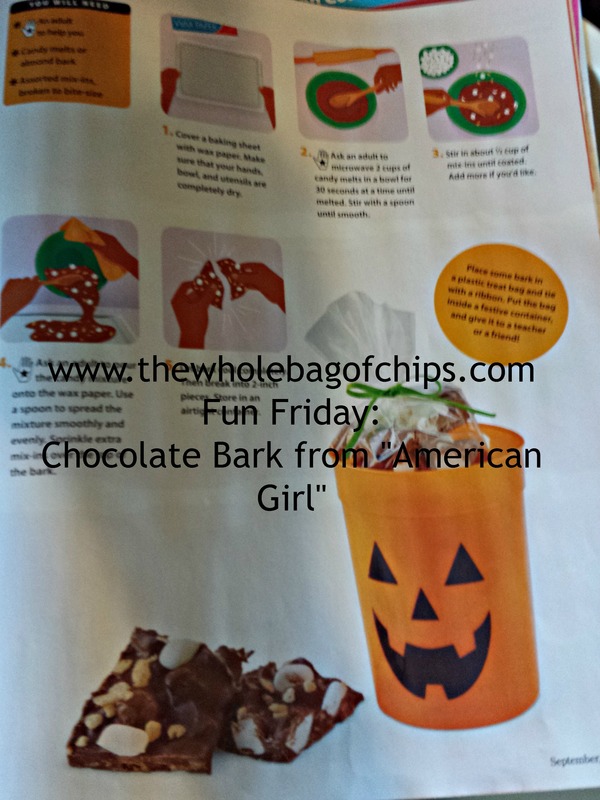 The “American Girl” magazine also showed five other types of bark, so be sure to check it out! I know that we’ll be making this again soon! I have some lovely bright blue and green candy melts. It’s going to be fun to make this recipe with different color candy melts! Thanks Jen!